When the load on the generator becomes unbalanced, negative phase sequence currents flows. The negative sequence components produce a rotating magnetic field which rotates at synchronous speed in a direction opposite to the direction of rotor field. Hence effectively the relative speed between the two is double the synchronous speed. Thus double frequency currents are induced in the rotor. These currents cause sever heating of the rotor and can cause damage to the rotor. The unbalanced stator currents also cause sever vibration and heating of stator. Hence it is necessary to provide the negative sequence protection to the generators against the unbalanced load condition. The negative phase sequence filter alongwith the overcurrent relay provides the necessary protection against the unbalanced loads. The negative sequence protection scheme is shown in the Fig. 1. A negative phase sequence filter is connected to the secondaries of the current transformers. 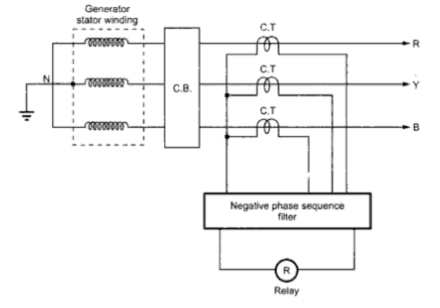 A negative phase sequence filter consists of resistors and inductors. These are so arranged that under normal operating conditions, the relay is inoperative. The filter circuit is stable for the symmetrical overloads up to about three times the rated full load. When unbalanced load occurs, the negative phase sequence filter circuit produces an output proportional to the negative phase sequence components. This is directed through the relay coil. Hence the relay operates to open the circuit breaker to isolate the generator.